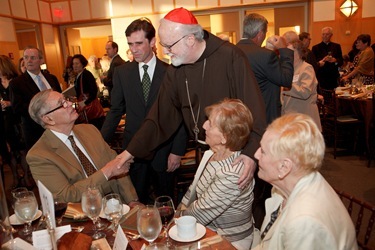 I have announced this week the creation of the Catholic Media Group, which is wonderful news for the archdiocese. We are committed to do even more in the way we use the media to communicate the Gospel message. 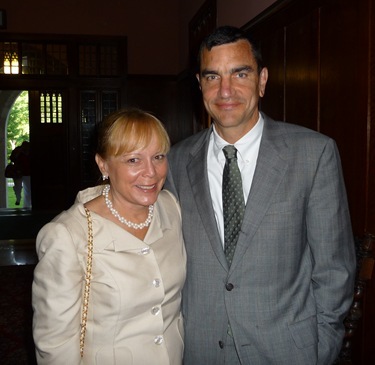 We are grateful for Scot Landry’s willingness to head up this excellent new initiative. 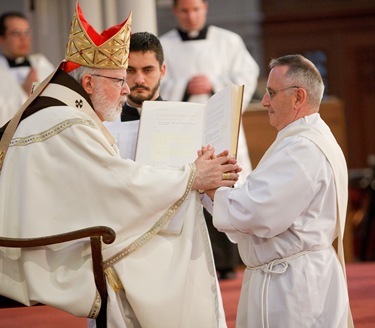 His ability and commitment to evangelization makes him the right person for this task. 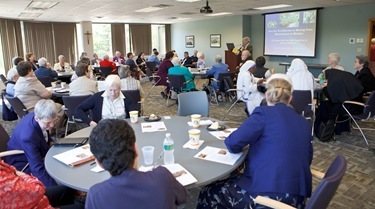 Last Thursday we hosted a meeting with 32 of the major superiors of women religious of congregations present in the archdiocese. At that meeting we presented, as we have been doing in the vicariates, the various priorities of the diocese and gave them the opportunity to give their input and reaction. 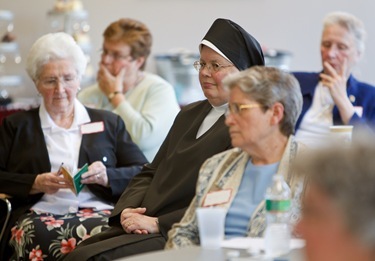 Father David Couturier made a presentation and then the sisters voiced their opinions and had an opportunity to ask questions. 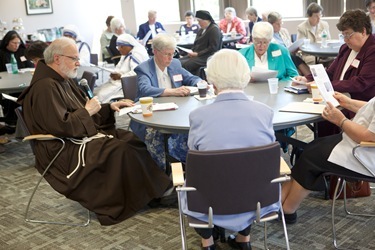 It was a wonderful opportunity to gather with the leaders of our women religious, who make such an important contribution to the life of our archdiocese. 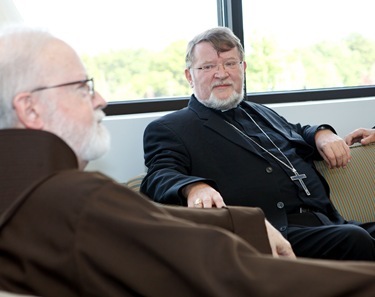 That same day Bishop Norbert Strotmann, Bishop of Chosica, Peru came by for a visit. He’s a German national but he’s been a missionary his whole life in Peru. He was up for the graduation at Stonehill College, where he received an honorary degree over the weekend. 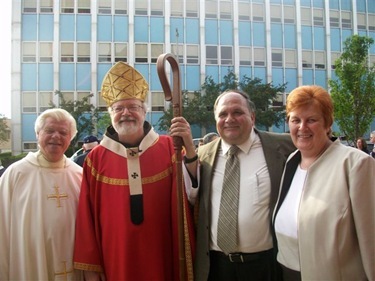 Bishop Strotmann has always been very supportive of the St. James Society in Peru. 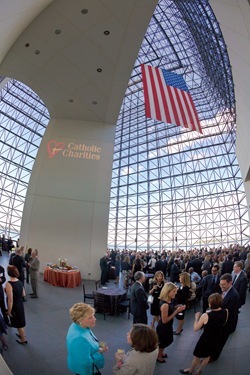 That evening, Catholic Charities held its annual spring celebration at the JFK Library. 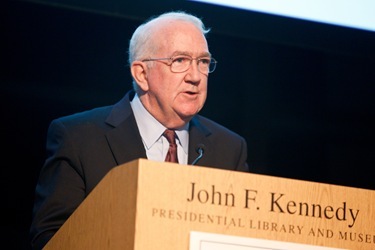 Honored this year was a native Bostonian, Ken Hackett. 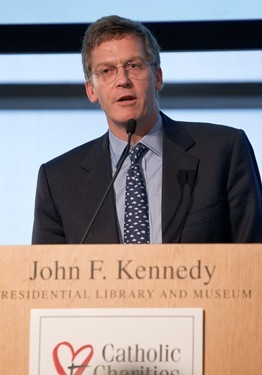 Ken is the president of Catholic Relief Services. 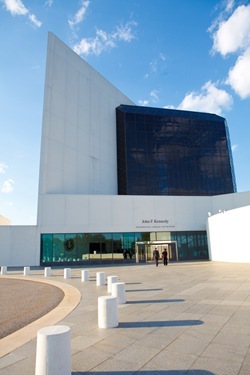 It was a unique opportunity to showcase the work of Catholic Charities locally as well as the relief work being done by the Catholic community in the United States throughout the world, particularly in Haiti . 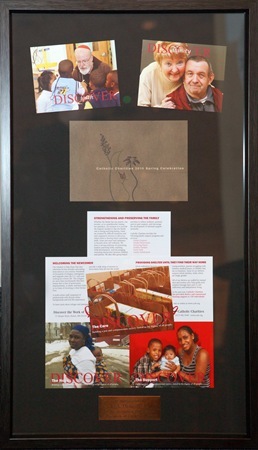 There was quite an emphasis on what CRS has done in Haiti. You can read Ken’s interview with The Pilot here. 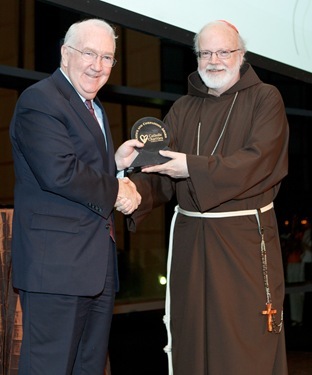 We also honored the late Jack Driscoll, who had been a chair of Catholic Charities. 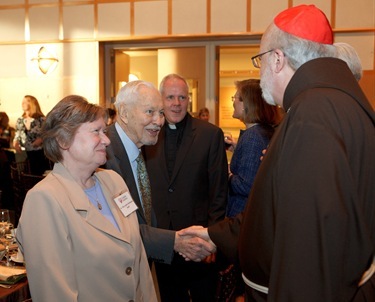 His son, John, gave a very beautiful account of his father’s faith and his devotion to the Church and to Catholic Charities. It was quite touching. 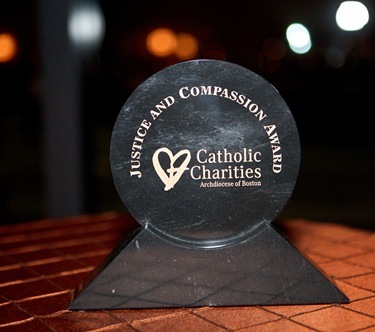 We presented his wife, Jane, with a plaque remembering all the great work he had done for Catholic Charities. We also announced a gift in honor of the memory of philanthropist Ray Tye from his family. The gift of $75,000 will go toward the St. Peter’s Teen Center in Dorchester. 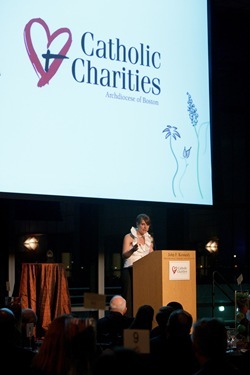 Catholic Charities president Tiziana Dearing also spoke about Charities’ great commitment to the poor and the great work they do, especially in the current economic climate. 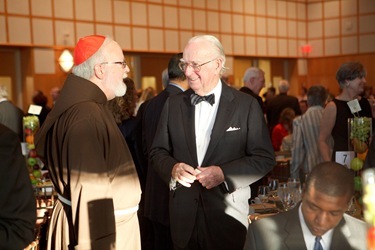 … including my good friend Cardinal Theodore McCarrick. 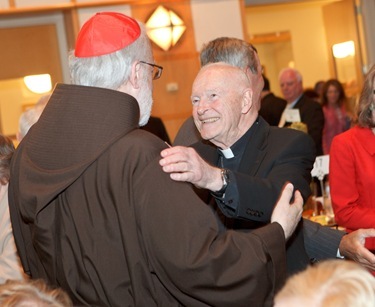 Cardinal McCarrick is on the board of CRS. 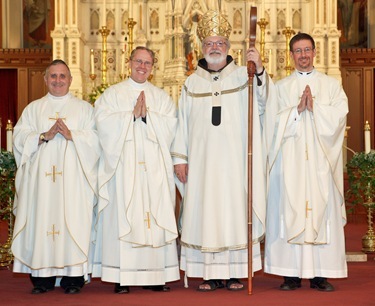 On Saturday, I ordained three men to the priesthood: Fathers Daniel Moloney, Guy Sciacca and Gregory Vozzo. 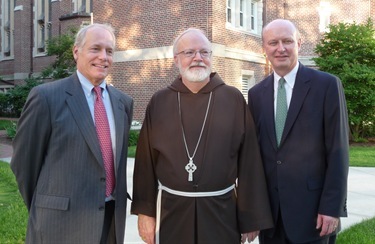 Fathers Moloney and Vozzo studied at St. John’s seminary and Father Sciacca completed his studies at Blessed John XXIII. 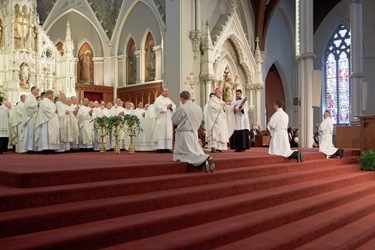 It is always a wonderful event for me to welcome new priests and, although this is a very small class for us, the day was beautiful. As I have mentioned in the past, in a way the size of the class reflects the fact that seven years ago the crisis was, in a sense, in full bloom. So, it wasn’t a time when there were a lot of men coming to the seminary. 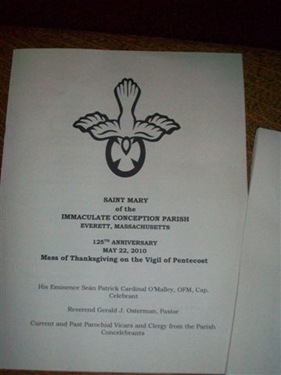 That evening I attended the 125th Anniversary of Immaculate Conception parish in Everett. 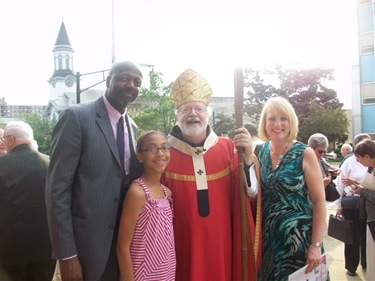 It was wonderful to be able to celebrate this wonderful milestone with the parish. 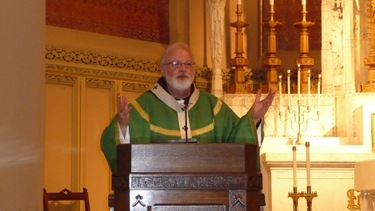 Father Gerry Osterman is doing a such a good job there. 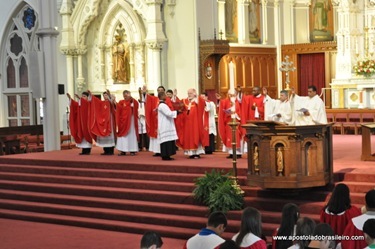 On Pentecost Sunday, I celebrated the Mass at Our Lady of Good Counsel in Methuen. 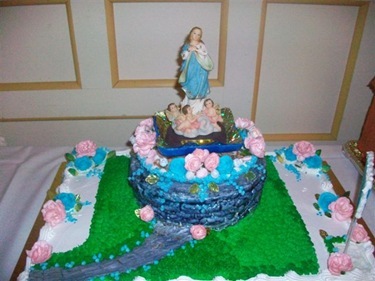 It was the 10th anniversary of the merging of the parishes which became Our Lady of Good Counsel. Fr. Peter Gori, the former pastor, was there along with Bishop McNaughton, who is originally from this parish. Father Gosselin, who celebrated the 51st anniversary of his ordination this year and who lives in the parish, also concelebrated. 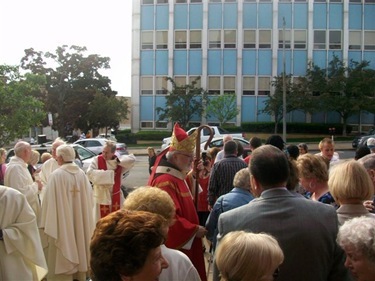 Father Marc Bishop is the pastor there and the communities have come together beautifully. 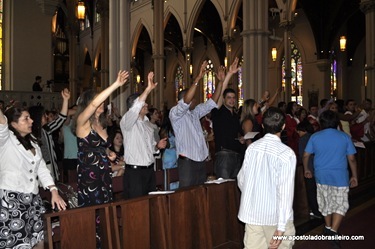 It is a very beautiful church with wonderful stained glass windows of St. Theresa in the apse. 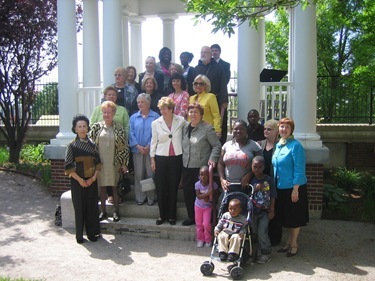 Later that day I attended the dedication of a Memorial Stone dedicated to the founders of the Massachusetts Ace of Clubs organization: Rose Fitzgerald Kennedy and Miriam Finnigan at the St. Mary’s Women and Children’s Center in Dorchester. The club is marking its 100th Anniversary this year, and so they wanted to mark it in a special way by this event. As a young woman Rose Kennedy, along with Miriam Finnigan founded the club for Catholic women to support different charitable institutions. They have done so much to help many worthy causes over the years. We are so grateful for all they do. 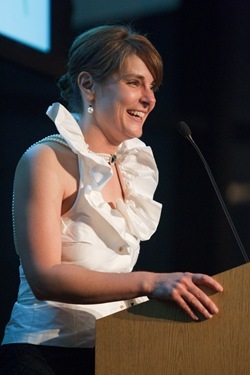 For 100 years the club has been very supportive of many different organizations, particularly of what is now called the St. Mary’s Women and Children’s Center. 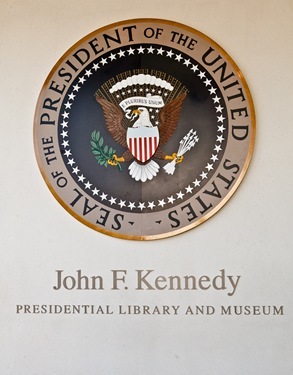 Originally it was called St. Margaret’s Hospital and Rose even delivered Ted Kennedy there. Judy Beckler is the president at St. Mary’s and she is doing an outstanding job. 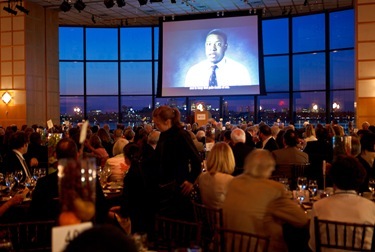 That evening, I confirmed close to 200 people from the Brazilian community. 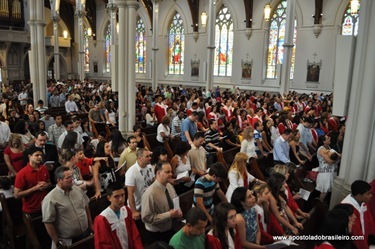 This is the second year that we have celebrated the confirmations for the Brazilian community at the Cathedral. 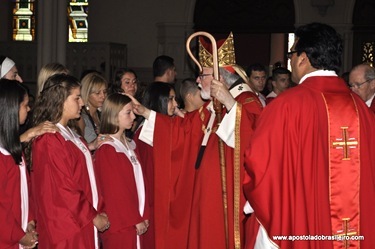 in addition to the teens, there were also quite a number of young adults who were confirmed. It was a very long celebration – over three hours – but it was met with great enthusiasm and great energy. I was sorry that Sister Elisete was not with us this year, but she is in Rome celebrating her silver anniversary. I want to give special congratulations to her. She is a dynamo in the Brazilian apostolate and she was sorely missed this year. We wish her many more beautiful years in her life as a sister. 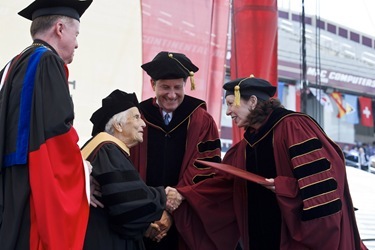 On Monday, May 24th Boston College held its commencement. 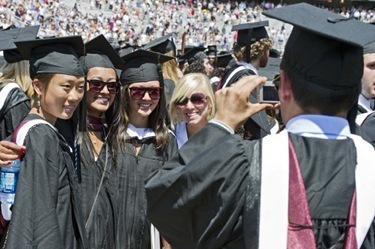 The commencement speech was given by Jeffrey Immelt, the chairman and CEO of General Electric. 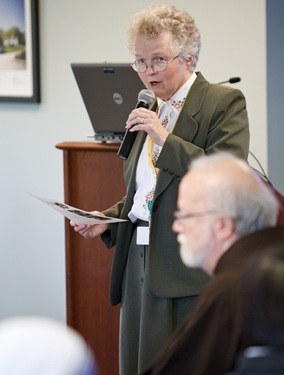 Among the candidates honored was Sister Mary Hart who is a religious and has worked for many years at St. Katharine Drexel Parish in Roxbury. She is very much an icon in that community. 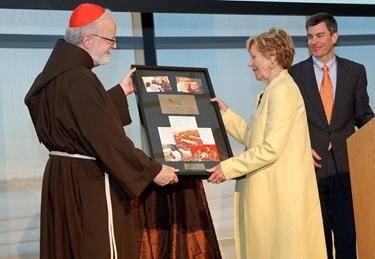 I was so happy that Boston College chose to honor her. 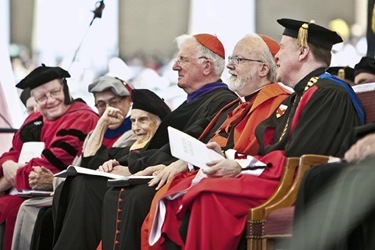 I am very pleased that in the last few years Boston College has honored someone working with the poor in the archdiocese, and I think that is a very good thing to hold up for the students to see. 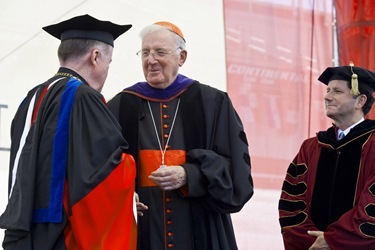 They also gave an honorary degree to Cardinal Cormac Murphy-O’Connor – the Archbishop Emeritus of Westminster in England. It was a beautiful and joyous day. On Tuesday I celebrated Mass and attended the Annual Dinner of Por Cristo, a charitable medical services organization working in Ecuador. 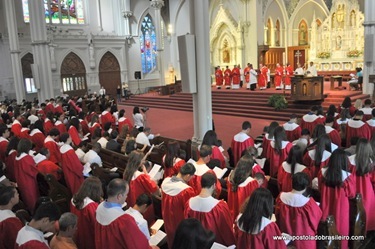 Por Cristo is part of Caritas Christi. 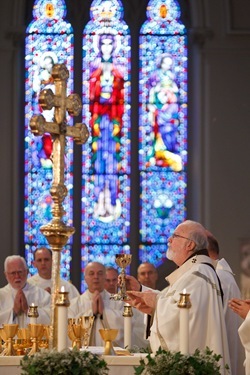 The Mass took place in the chapel at Emmanuel College and the dinner, which was extraordinarily delicious, was in the College’s Yawkey Center. 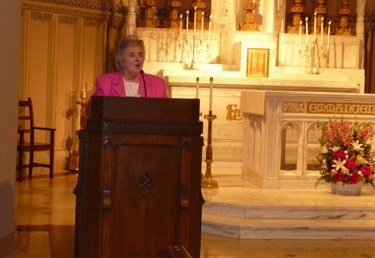 Sister Janet Eisner, President of Emmanuel, and everyone there always offer such wonderful hospitality. It was great to be with a number of members of the Por Cristo Board of Trustees, including Gary Kaneb who is the board chair. Gary and his wife, Diane, sponsor the dinner which means that all the money raised goes to the important mission of Por Cristo. As I mentioned, Por Cristo’s work takes place in Ecuador and involves providing health care to some of the poorest of the poor. 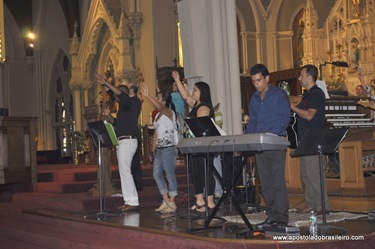 Por Cristo has been around for over 30 years having started in response to Pope John Paul II’s visit to Boston in 1979. For many years, they sent over 120 volunteer medical teams on short missions to Ecuador. Then in 1995, in response to requests for help in dealing with the terrible problem of malnutrition which was killing many children, Por Cristo developed a new model which employed local Ecuadorian medical professionals working full-time year round. This led to the construction of the Por Cristo Nutrition and Health Center, which is a primary care clinic in the Isla Trinitaria barrio of the city of Guayaquil. Last year at the center, the staff of 16 conducted over 18,500 consultations, mainly to children under the age of five and women of child-bearing age, in all sorts of medical disciplines. Por Cristo has maintained one of the traveling teams, that being its Pediatric Cardiology Team. Dr. Tom Hougen, the team’s leader and a member of the Por Cristo Board came up for the Mass and dinner from Washington, DC, and it was great to see him. This group has been at work for over 20 years and in addition to their annual visit to Ecuador, they donate a great deal of materials and equipment. Last year, thanks to Por Cristo’s donations and teaching, Ecuadorian doctors were able to conduct over 1,0000 cardiac procedures on children throughout the year. As Joe Reardon, Executive Director, of Por Cristo pointed out at the dinner, with the world economy being what it is and the real need to respond to so many disasters around the world, it would be very easy to forget the everyday poor in so many places like Ecuador. We can’t let that happen. 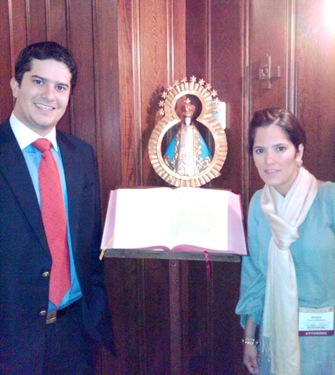 On Sunday I visited with Pablo and Beatriz Casco — they were visiting from Honduras. They are both attorneys and were here for a legal convention. They are brother and sister. I baptized Beatriz 25 years ago in Washington. 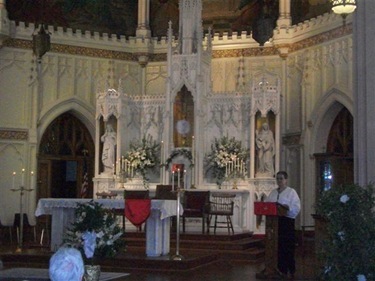 Her parents are very dear friends of mine who, many years ago, gave me the lovely statue of the patroness of Honduras – Nuestra Señora de Suyapa – which is in the chapel in the rectory. We took this picture so that they could show their parents. Also on Sunday we were visited by four Capuchin friars. 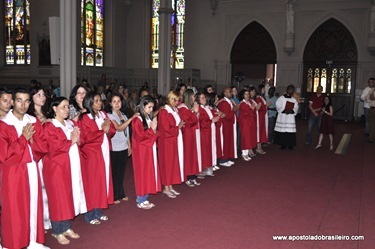 They were here for the Brazilian Confirmations. 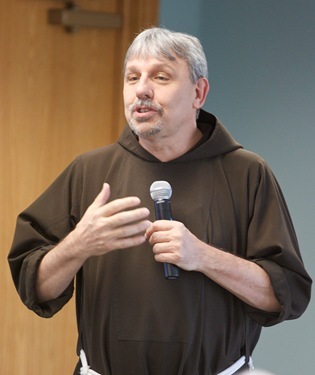 They were Father Paul Dressler, Brother Richard, Brother Juan Antonio and Brother Philip from Bavaria, Germany, who has been studying at Capuchin College in Washington. Every year we try to identify the tackiest piece of kitsch-art that comes from Lourdes. 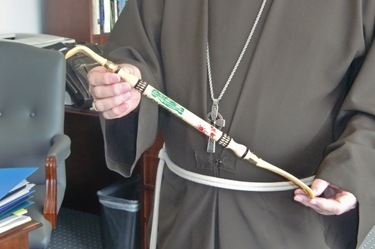 This year it’s the Lourdes back scratcher and shoe horn that somebody brought to me. Last year it was a potholder, and the year before that it was a clock that played the Lourdes hymn for the alarm! 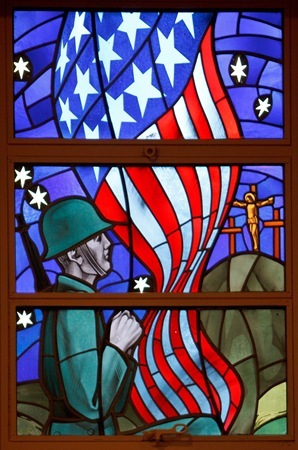 Finally, this Memorial Day, please remember to pray for all those who have given their lives for our country. May they rest with the Lord. I hope and pray you all have a safe and restful long weekend! I’m a freshman at Boston College High School. I’ve posted a couple of other comments before so you may remember me. I just wanted to say that it was great that you ordained three new preists because we are in need of new preists as our current ones are diminishing. Keep up the good work. My name is Bernabe Rodriguez and I am freshman at BC High. In my religion class we speak alot about how the number of priests neing ordained is decreasing and it shows in your ordinations. 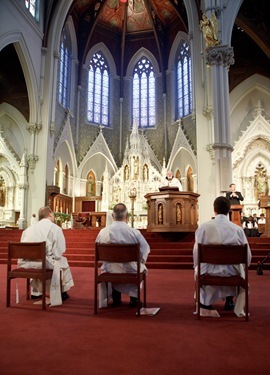 Even though we may have only a few priests being ordained they are good men listening to God’s calling. I enjoy your blog. 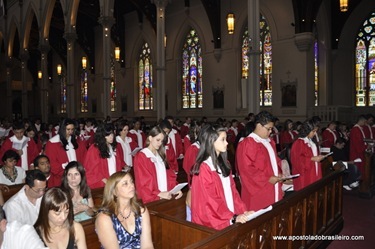 I am a freshmen at Boston College High school and am aware of the issue of the lack of ordained people we are seeing in the church. Our generation is going to have to step up and change this, and hopefully we will. We have to encourage people to enter these lives based on choice, so that we can continue with a healthy and full church. 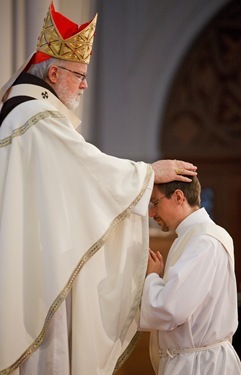 I am a freshman at Boston College High School and we talk a lot about how only some good young men are becoming priests and it really shows it in your ordinations. I really enjoy reading your blog and I hope you continue your great work. Thanks so much for your blog. I am a student at UMASS Boston. 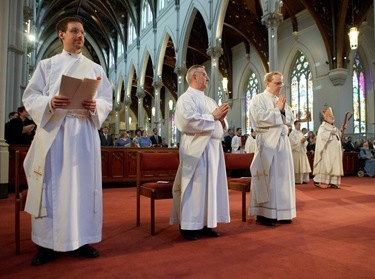 Your blog is cool and I was happy to read about 3 new priests ordained. The Cathedral looks so beautiful!!! 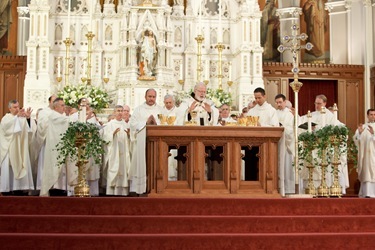 I notice a lot of young priests today really love the Eucharist. 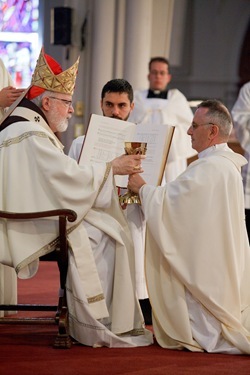 At the parish I go to, Sacred Heart in Middleboro, MA, our young priest is having a Corpus Christi Sung High Mass on Thursday June 3 at 5:30 PM. AND, a procession will follow!! I think that’s awesome!!! 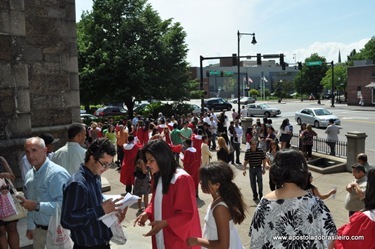 I saw pics of the procession you did in Boston a few weeks ago and that looked great. I felt really inspired and can’t wait to take part in this one at my parish. Your Eminence, thank you for your leadership. 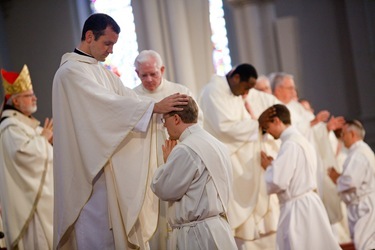 In this Year for Priests I think you must be a great inspiration to the priests in your archdiocese. You are always in our prayers!!!! !